Investors in international funds should have a horizon of more than five years. Not only will this help them overcome equity and currency volatility, it will also help them enjoy better tax treatment, says Sanjay Kumar Singh. 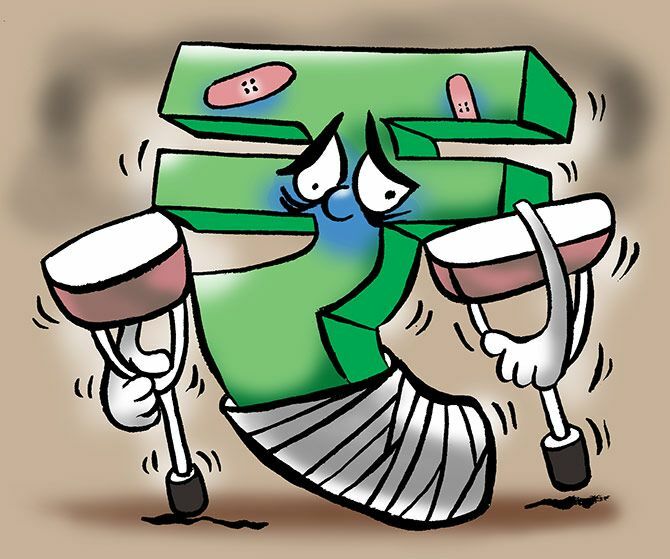 The rupee touched an all-time low against the dollar recently and is now trading at the 70.11 mark. It has depreciated 8.90 per cent against the dollar year-to-date. One way how investors can protect themselves against currency depreciation is by investing in international funds offered by mutual fund houses in India. Investing in international funds makes your portfolio less dependent on the Indian market. "Investors should look to have global exposure as international diversification helps bring about stability to their portfolios and enables them to participate in growth beyond home frontiers," says Anand Radhakrishnan, chief investment officer, Local Asset Management - India Equity, Franklin Templeton Investments India. Most Indian investors' fortunes are overwhelmingly tied to their home economy and markets. "Most Indians earn in the Indian rupee and invest in Indian stocks and real estate. If the Indian economy does not do as well as expected, their future could be affected. Hence, instead of putting all eggs in one basket, one should be globally diversified," says Tejas Khoday, chief executive officer and co-founder, Fyers Securities. During times of high prices of commodity, especially crude oil, India witnesses higher inflation, and its fiscal and current account deficits also rise. Poor macros affect the Indian market's performance in such phases. An investor's portfolio will be less affected if a part of her/his investments is in international equities. Many affluent Indians nowadays have financial goals that are denominated in dollars (or other foreign currencies). Some want to send their children abroad for higher education, while others wish to buy a house in a foreign country. Due to the higher level of inflation in India, the rupee tends to depreciate around 2 to 3 per cent against the dollar annually. "Investing in assets denominated in a foreign currency will allow you to offset the impact of long-term currency depreciation," says Nikhil Banerjee, co-founder, Mintwalk. In domestic equity funds, you pay a long-term capital gains tax of 10 per cent if you have held the units for more than a year. International equity funds are treated on a par with debt funds for tax purposes. If you hold them for more than three years, you will be taxed at 20 per cent with indexation benefit. "On a domestic equity fund, you will be taxed at 10 per cent even after five years. In an international equity fund, the effective tax rate could be lower than 10 per cent if you hold it for more than five years, due to the indexation benefit," says Banerjee. When investing in domestic funds, you have to look at the quality of the underlying portfolio, expense ratio, and so on. Due to a paucity of information and a lower level of familiarity with foreign equities, Indian investors might find it more difficult to make these assessments in the case of international funds. Also, while an investor is likely to benefit from the rupee's depreciation against major foreign currencies over the long term, there is no guarantee that cross-currency movements will always be favourable in the short term. Financial experts advise that US-focused funds should be your first investment abroad. "Many US-focused funds invest in large-cap stocks listed in the US. These are global leaders that earn their revenues and profits from across the globe. "Stocks like Google, Facebook, Alphabet, etc might be listed in the US, but they benefit from growth in emerging markets as well. Investing in these funds is akin to taking a bet on global growth," says Banerjee. The US is also the world's largest equity market with the best corporate governance standards. According to Radhakrishnan, "Apart from reducing volatility of returns, such investments help investors access global leaders in products, technologies and services, and piggyback on their growth." US-focused funds can give you exposure to sectors not available in India, such as global defence players, technology hardware players, and so on. When selecting a US fund, make sure that you bet on a well-diversified fund (not one with a sectoral bias) that invests in large-cap US stocks. The weight of large-cap companies in your portfolio should exceed 50 per cent. Remember, it is the US large caps that are global companies whose growth you wish to benefit from. The correlation between the US and the Indian equity markets is not negative, but it is low. So, while the US fund in your portfolio will not necessarily rise when the Indian market tanks, it will at least help stem the loss in your portfolio. Radhakrishnan advises that as in the case of domestic equities, investors should take the systematic route in international funds as well. Only those investors who have a well-diversified portfolio of domestic equity funds should foray into international funds. Those new to equity investing should avoid. Investors in international funds should also have a horizon of more than five years. Not only will this help them overcome equity and currency volatility, but it will also help them enjoy better tax treatment. Allocation to these funds should not exceed 10 to 15 per cent of the equity portfolio. Buying property from an NRI? IMPORTANT tax tips!